In 1840 David and Sarah Ramsay set up a Sunday school, which was taught by the daughters of the family on the verandah of their house. 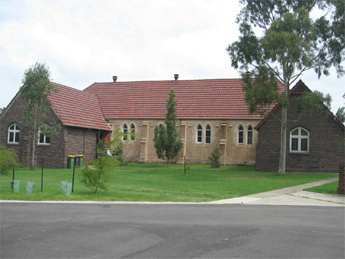 This was the first Home Sunday School of the Presbyterian Church in New South Wales. David and Sarah drew up a plan of the estate in 1860, setting aside an area of 4 acres as the site for a Church, School, Vault Reserve (Private Graveyard) and Manse. Later that year however, David died after a short illness. In 1861 Sarah was instrumental in seeing that a School hall was built on the site. The foundation stone was laid by Percy Ramsay, due to his mother's illness. Alexander Learmonth who later married Sarah and Davids eldest daughter, Mary Louisa, was the first Superintendent. In 1862 this hall was used as a day school known as Yasmar School, a Sabbath School and also for Church services from 1866. A petition signed by 134 residents and presented to the Presbytery of Sydney on May 1st, 1866, asked for the supply of ordinances to the congregation gathering there, and after this had been granted John Dunmore Lang conducted and preached the first service on 4th May, 1866. It was resolved at the next meeting of the Presbytery that steps should be taken to secure the services of a permanent minister. The Rev. S.F. Mackenzie of West Maitland accepted the position in January 1867. A session was formed, and David Ramsay became one of the first elders, along with Alexander Learmonth and H.Carlisle. From this time the congregation increased in numbers, and at a meeting held on the 25th July, 1866, and chaired by the Pastor, it was resolved that the time has arrived for the erection of a Church at Dobroyd: that the name be designated St.Davids Presbyterian Church, Ashfield; that the land upon which said Church is to be erected shall be vested in eight trustees to be chosen by the congregation and that uninterrupted access to the Church Hall shall be at all times available to the congregation along the road now leading hereto. The second resolution was that the following should be trustees: Mrs. Ramsay, the Rev. S.F.Mackenzie, Messrs. David Ramsay, Alexander Learmonth, John Woods, John Pope, William Drynan and John Tait. A third resolution was proposed that the trustees be empowered to take the necessary steps for the erection of a Church and that a subscription list should be opened. A sum of £1673/10/- was raised, of which £1000 was donated by the Ramsay family. Mrs. Ramsay laid the foundation stone for the Church on the 28th April 1868, in the absence of the Duke of Edinburgh, who had been prevented from attending by an attack on his life. A glass jar containing copies of the daily papers, current coins, and the parchment scroll read at the ceremony were placed under the stone, the location of which is not now known. The Sydney Morning Herald of the 29th April 1868 gave a full account of the proceedings, and description of the Church to be built. Thomas Rowe had been engaged to design the Church, and Frederick Lavers as the Contractor. In August 1869, Mrs. Ramsay conveyed 4 acres and 17 perches of land to the Presbyterian Church of New South Wales. This land was to be used for a Church, School, Manse and Family Vault, so fulfilling the dream she had shared with her husband David. The School had already been built, and the building of the Church had commenced. St David's Church was opened on the 27th March 1869, and again a full report was published in the Sydney Morning Herald. The Duke of Edinburgh was on hand to plant a Moreton Bay Fig tree, which no longer stands, but a plaque can be seen in his honour in the front fence. The Reverend Simon Fraser Mackenzie was the first minister, remaining in the position until 1869. The Church is built in the Gothic style, with a Norman tower. The tower was originally topped with a spire of hollw metal sheets, with a metal rod running down the centre. The spire became unstable, and was demolished in 1920. At each corner of the tower is a small stone spire. 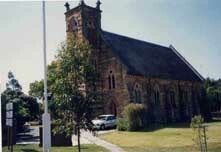 The sandstone used to build the Church was quarried on the Dobroyde estate, perhaps near Iron Cove. Dr David Ramsay and his wife Sarah Lord were committed to the education of children, and were instrumental in establishing the first Home Sunday School of the Presbyterian Church in NSW in 1840. The Sunday school was attended by local children, with the daughters of David and Sarah conducting the school on the verandah of Dobroyde House. After the death of David Ramsay, Sarah set about realising their dream of establishing a school, Church, Manse and Burial Ground on a portion of land given to the Presbyterian Church for this purpose. The school, known as Yasmar School, was built in 1861, and became the meeting place for not only the daily education of the children, but also for the Sunday school and for Church services. The foundation stone for the school was laid by Percy Ramsay, as Sarah was ill and unable to attend. The first Superintendent of the Sunday school was Alexander Learmonth, who married the eldest daughter of Sarah and David Ramsay, Mary Louisa, in 1850. Alexander was born in Linlithgow in Scotland in 1810, and came to Australia in 1842. As the congregation grew it was apparent that the hall was too small for the purposes for which it was being used, young peoples groups, concerts and social activities. In May 1926 the Secretary brought a motion before the teachers that a fund should be set up, the Sunday School Building Fund. This was to erect a second building, but in fact, was used to modify the existing hall. Alterations began in 1930; brick additions being made to each end, but the original sand stone building can still be seen. AND THE ORIGINAL SCHOOL HALL IN 1869. The final part of the dream of David and Sarah Ramsay, for a Manse to be erected where the Minister and his family could reside and from which the Minister could conduct Church business, came to fruition in 1911. On 30th December, 1910, the Reverend Angus King arrived at St Davids, and began to put in motion the means to build the Manse. Permission to mortgage portions of the Church lands was given by the Presbyterian Assembly in March 1911 in order to raise funds, and the foundation stone was laid on the 22 April 1911, by Mrs J H Goodlet, with a talk given afterwards by the Rev Angus King. The Manse was completed by 11 August 1911, and Rev King became its first occupant. St Davids was now surrounded by the federation style houses that comprised the garden suburb developed by Richard Stanton. The Manse was constructed on ground set aside by the Ramsays for such a purpose, and the design was in keeping with the surrounding buildings, with a Gothic influence relating to its proximity to the Church and Church Hall. It was designed with a dual purpose in mind: both as a family home, and also as a church office, where business could be conducted.